The successful design of mechanisms for products, tools and equipment relies on excellent concepts and properly designed details. Both are covered in this book. Many of the examples presented have been realised in practice and properly evaluated, giving the reader/designer a high level of confidence. Every example comes with the considerations underlying the application and the limitations of the particular idea. 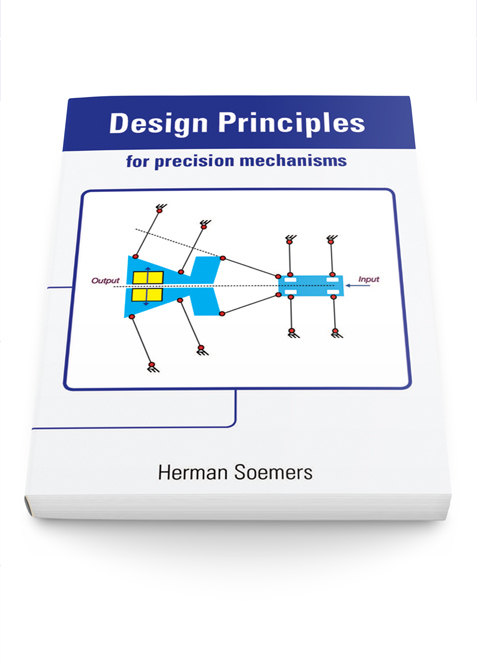 This book is based on the work started in the 1960s by W. van der Hoek at Philips in Eindhoven, the Netherlands, and subsequently continued by M.P. Koster, culminating in the Dutch-language book “Constructieprincipes” [Design principles for accurate movement and positioning]. The core of their design approach has been preserved, while theory and examples were updated and the English language was adopted to reach a broad audience within the Netherlands as well as abroad. Herman (H.M.J.R.) Soemers is associated with the University of Twente, Enschede, the Netherlands. He also works as a technology manager mechatronics with Philips Innovation Services, Eindhoven, the Netherlands. Bestellen kan via e-mail. Zodra uw bestelling verwerkt is worden de betalingsinstructies naar u verstuurd per e-mail. Houd rekening met een verwerkingstijd van ongeveer een dag. Ordering can be done by e-mail. Payment instructions will be sent to you by e-mail as soon as your order is processed. Processing time can take up to one day.